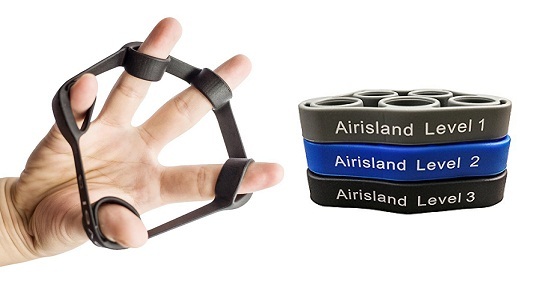 These finger resistance bands can drastically improve your finger strength and specially designed for athletes such as rock climbing, enthusiasts, fitness, tennis, baseball, boxing, golf, shooting, musicians, guitar players, bass players, pianists, and violinists. Very handy and you can use it anywhere, anytime. A simple yet modern looking finger exercise bands making your day perfect while doing any simple activity such as watching tv, office, school and any place you want to exercise. Made up of 100% 1st-grade silica gel and BPA fee rubber to ensure your safety and ease. This hand stretcher is washable and last longer with three levels 1, 2, and 3 for perfect stretching. If you are suffering from rheumatoid arthritis, arthritis, carpal tunnel, tendonitis, tennis elbow and on the way to recovery from fractured or broken wrist or tendon surgery, this finger stretcher will help you a lot.